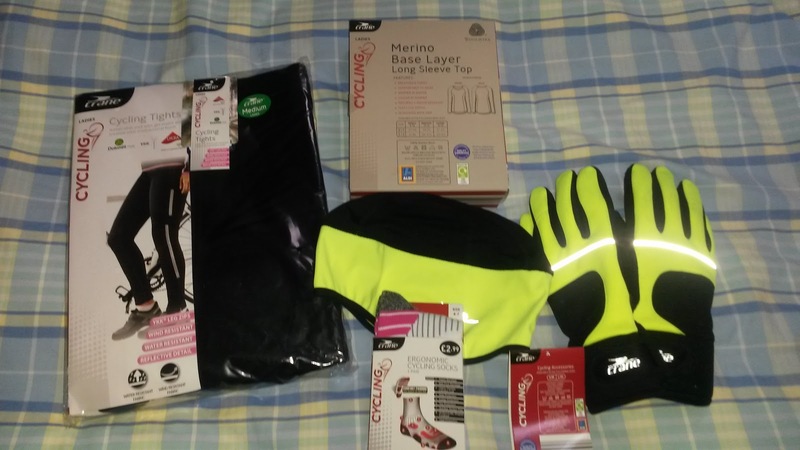 I do a lot of cycling so was thrilled to be asked to review some cycling clothes from Aldi. With the summer fast disappearing I knew I wouldn’t be able to wear my shorts for much longer and had been looking at winter cycling clothes but with cycling gear being quite expensive looking was as far as it went! Thanks to Aldi I am now set up for winter with a great set of clothes that include a pair of tights, Merino base layer long sleeve top, winter cycling gloves, hat and ergonomic cycling socks. The ladies tights are available in sizes S – L and are very reasonably priced at £13.99, I am usually a size 14 and the medium leggings are a ladies size 12-14 and were a perfect fit. 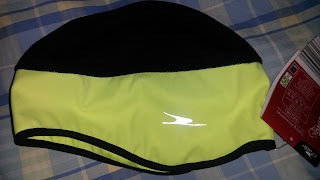 The tights have reflective strips down the legs which is important when cycling in winter and a zip at the bottom of the leg which makes taking them off much easier. I am 6 foot tall and used to sports clothes being a bit short in the leg but I found the Aldi tights quite a good length and a pair of black socks will cover the gap between the bottom of the tights and my ankles. The tights are a really good fit, they have an Italian gel seatpad which was really comfortable, even on long rides and even though they weren’t quite long enough in the leg for me they didn’t ride up at all when I was riding. They have a wind and water resistant front fabric and are inside brushed for warmth, I haven’t used them in the wet yet but I can certainly vouch that they kept my legs lovely and warm on an early morning ride. The Merino base layer top costs £15.99 and is the perfect extra layer in the winter months. It is warm enough to wear on its own, under a jacket when it is cooler or when it gets colder as a base layer. It is made of 100% pure Merino wool and is breathable and naturally odour resistant. It is longer at the back for a better fit and importantly doesn’t ride up when riding my bike. Again I tried the medium and found it was a very good fit and very comfortable to wear. The sleeves were a good length and it felt soft on my skin. The cycling gloves are unisex and are available in XS-XL. They are very reasonably priced at £4.99. They have a warm lining and padded palm and have a velcro strip at the wrist to ensure a good fit. The reflective detail will be good when cycling in the dark and will help make me more visible to other road users. 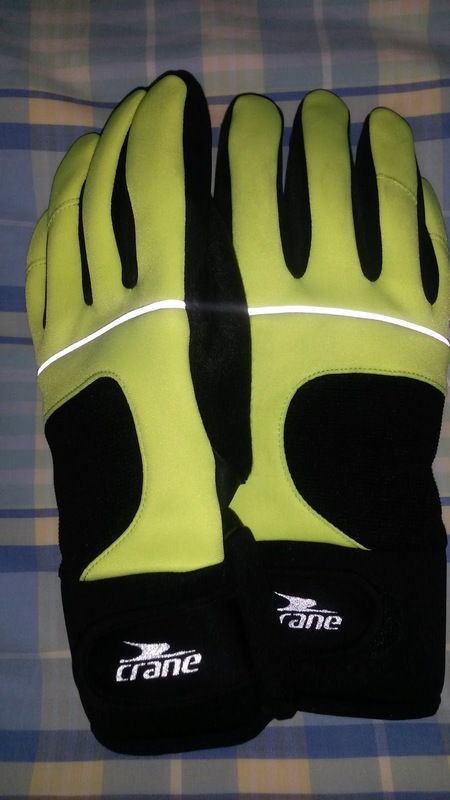 They have a windproof and waterproof membrane so I won’t have cold, wet hands this winter. I received a pair of XS gloves and thought they would be too small but in actual fact they fitted really well. The cycling cap fits snugly under my helmet and will keep my head and ears warm. The softshell fabric is waterproof, breathable and wind resistant. It costs £4.99 and is available in Black, sizes S-XL or Black/Neon Yellow, sizes S-XL. 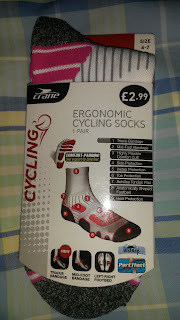 I normally wear my everyday socks when cycling but Aldi also sent me a pair of their ergonomic cycling socks to try. 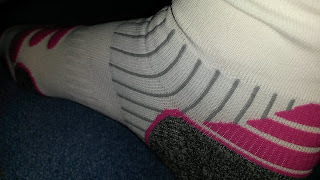 The socks are specially designed and they even have L and R on them so you know which foot to put them on! They are for size 4 – 7 but they were still comfortable on my size 8 feet. I didn’t realise socks could be so hi-tech but these have a triaxis bandage which supports and stabilises the ankle with compression and mid foot bandage to stabilise the central part of the foot and provides sufficient cushioning in the shoes. As well as this there is comfort padding which is integrated padding systems where the feet need particular support. With so much support it’s no wonder that these socks were really comfortable to wear. Everything is machine washable and up to now I have washed the leggings, Merino top and socks, they have all washed well, even after a particularly muddy off road ride. I have to say I am really impressed with both the quality and fit of the clothes and of course the price. I will be popping down to Aldi this week to kit out the rest of the family with winter gear as they are all quite envious of my new cycling clothes. It’s also great when I am busy to be able to pick up new cycling gear when I am doing the weekly shop. If you cycle I would certainly recommend that you get down to Aldi and look at the great range of cycling gear that they have and get kitted out for winter.